Abundant passenger space, excellent fuel economy and strong value make the Hyundai Accent one of the smartest buys in the subcompact segment. Its road manners aren't as lively as the Honda Fit and Ford Fiesta, but the Accent's general excellence and eye-catching "fluidic sculpture" design help make up for any dynamic shortcomings. Big features for a small package. 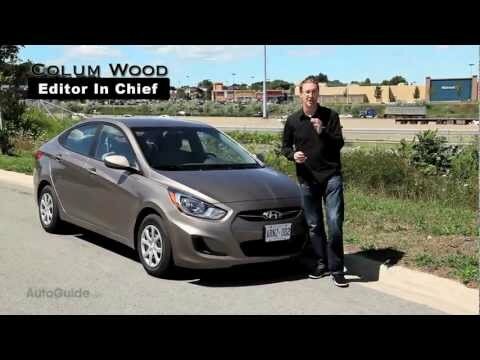 The Hyundai Accent is a compact car perfect for traveling short distances within the city. We have also used it for long distance travel and have had no difficulties. It has cruise control for use on longer trips. The car gets very good gas mileage over 300 miles to a tank full. This model has a hatchback. This is very convenient for hauling groceries. It can also handle several bags of luggage without a problem. The backseats will fold down to expand the cargo space for larger loads. The four doors makes it easy to load and unload passengers. We have been able to comfortably seat 5 adults or 2 adults and 2 children using car seats. It also has a sunroof which is an unexpected feature for a small compact car. In terms of reliability, other than regular oil changes and replacing tires when needed there has been no additional reasons to get maintenance. The car has a sensor to ensure the tires maintain adequate pressure at all times. A light will display on the dashboard if there is an issue. There are a few things that you should be aware of before purchasing this vehicle. It sits low to the ground and could prove challenging for some drivers. The leg room is limited and would not work very well with a taller individual. The front bumper is fragile. It will crack if hit by road debris or cement curbs. This vehicle does not have a spare tire. All in all it is a great car for not very much money. My car, the silver Hyundai. My Hyundai is silver. It is a compact car that is just the right size for me. It get a moderate gas mileage. It never need fluids added to the engine. I have never been in an accident in it so I do not know how well it withstands impacts. We have taken our Hyundai on several trips. One of those trips were to central oregon. It did not overheat, other than the temperature inside the vehicle. Driving it for several hours at a time didn't seem to impact the engine or anything else. A week or so later we drove it to southern oregon and back. Again, we did not have any problems with it driving that far. We did not get into an accident, it did not overheat, we did not have any problems with the tires, we did not have problems with the electrical system, we did not have problems with the heating and cooling systems, we did not have problems with the exhaust system or anything. It was a smooth drive, where my friend was able to take pictures out the windows. The radio works like a dream, no matter our location. I think that I have had to replace a fuse in it one time, but I am unsure. I do take my Hyundai in for its annual checks each year. I have not had to have any major car repairs done on it though. I only recently had to replace the tires. They had lasted over six years. It has been a wonderful car and I would purchase another like it. The look because it has the sporty look to it. That is what drawn me to it. Hi, my Hyundai Accent hatchback 2012 has been the best car I have driven in years of finance Hyundai’s. I have owned two other Hyundai’s and this has been the best one. I have owned all my vehicles and the other two would give me a lot of problems all the time. This hatchback has not hd but one battery put in and that was in 2017. Then I had tires put on in 2014. Then I had tires put on in 2018. I had my first set of brakes put on in 2018. This all the work I have had done since I had the car and it is running still great. I do get scared of the car being so low in snow. I would not recommend driving very high snow. Also, it has great speed. Great turns and till this day I get compliments on my car especially the color sky blue. . . Almost looks grey at night. They should own more Hyundai’s in this color. Not just in certain makes. All colors should be available in all makes. If I get another Hyundai’s they better have this color available in this color especially the Kona. Have a big interest in this car. But lastly my 2012 vehicle has had one? I am trying to figure out that just started is that it gurgling when press on gas pedal but no one can figure out why. Not even Hyundai that noise drives me nuts. But otherwise love my car. Recommend to anyone.